The recent introduction of Burkert’s Type 2702 manually operated angle seat valve is a welcome addition to our already extensive range of manual and actuated control valves. 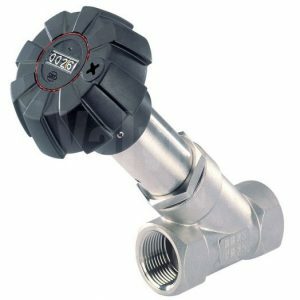 Available to order in stainless steel with threaded or weld end port connections, in sizes ranging from 1/2” to 2”, this valve is a top performer. A larger and more dependable alternative to traditional needle valves and fills the gap of a Manual Control Valve. When a set flow is needed, the Burkert Type 2702 manual throttling / control valve is the perfect fit allowing the flow to be adjusted and set to the ideal flow rate for your application. This manual valve is supplied with position indicator and there is an option of a lockable Handwheel, which prevents unintentional or unauthorised changing of the valve position. Designed with a parabolic trim which gives super control of a defined flow. With a pressure range from 0-16 bar on the ½” to 1” and 0-10 bar on the 11/4” to 2”, and temperatures up to 180°C makes this valve ideal for control of steam, water, alcohols, oils, fuels, salt solutions, lye and organic solvents. One such application where we used the Burkert Type 2702 was for an existing customer who needed to cook small batches of product (jam) in double jacketed pressure cookers using steam. Our customer used a cooker to produce new recipes and small batches of jams and preserves. He didn’t want to invest in a large, high cost control system, so he asked for our help (we had previously supplied hygienic valves and controls to this customer). The steam he was using from a common line at around 7 bar was too high for the cooker so we supplied a DR20 pressure reducing valve. This valve allowed us to put steam into the cooker at the right pressure however the flow needed to be controlled to the desired rate of flow, to cook the jam without burning. The perfect valve for the job was the Burkert Type 2702. An alternative option would have been to supply a flow indicator on this job but the engineer/chef was confident in using thermometers. This application is one of many that this handy low cost manual control valve can be used for. This flow transmitter is specially designed for use in neutral, slightly aggressive, solid free liquids. 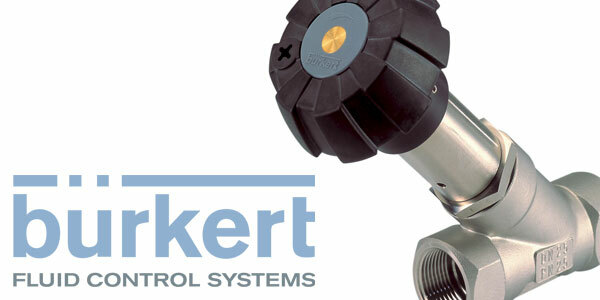 The Burkert designed fitting system ensures simple installation of the sensors into all pipes from DN06 to DN65. This intelligent mini transmitter/switch with an extra-large display is specially designed to switch alarms and to establish a monitoring system or an On/Off control loop. The compact Type 8314 pressure transmitter meets the highest requirements with regard to mechanical loading, EMC characteristics and operational reliability and is particularly suitable for demanding industrial applications. This intelligent sensor/switch with an extra large display is specifically designed to switch a valve and to establish a monitoring system or an ON/OFF control loop. Compact and wall versions are available. For more help with your control valve requirements do not hesitate to get in contact with the technical team at Valves Online by telephone on 01822 855 600 or by email on sales@valvesonline.co.uk.